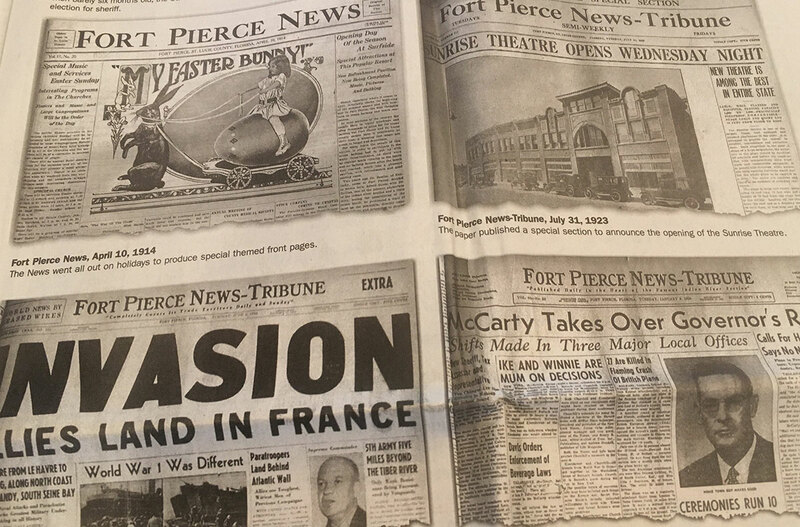 The archives of newspapers such as the Fort Pierce News-Tribune provide snapshots of life along the Treasure Coast over the last century. A session during this year’s Treasure Coast History Festival Jan. 12 will focus on preserving these records and others such as photographs in digital form. When I was a rookie reporter at the Fort Pierce News-Tribune back in the late 1970s, I wore a variety of hats (but never a green eye-shade like you see in the old movies). As the youngest and least-tenured reporter on the staff, I was thrown a variety of assignments the senior reporters were able to avoid. Most of these involved putting together items that had templates so they could be easily or quickly written. In other words, things that didn’t require much writing talent. I wrote obituaries for the city desk off the forms representatives from the local funeral homes would drop off just before the daily deadline. I wrote engagement and wedding announcements that excited mothers of the brides and brides-to-be left at the lifestyle desk for the big spreads in the Sunday paper. I visited the courthouse to gather the civil suits and other listings. I’d open the volumes one at a time and go through each one for the same seven-day period, covering the week that would start with the upcoming Sunday paper. Looking back on it, those old newspapers were the only social media of the day. You’d find that “Mrs. Clyde Tiddlywinks recently returned from a motor trip to Miami.“ Or “Mr. and Mrs. Henry Clinkscales are enjoying the company of visitors from Cashiers, N.C.’’ Especially, in the older editions, you’d find such little nuggets on Page 1 nuzzled in with the major news stories. Some of the volumes were so old and brittle that you’d have to piece them back together to keep the historic record straight. What lay before me in those bound volumes were historical snapshots of the community I was covering. They gave me a sense of what was important to the region over time and how it evolved. Though our area newspapers in St. Lucie, Martin and Indian River counties have gone through various ownerships over the last decades, we are fortunate that the company that owns them today, Gannett, has digitized many of the newspapers going back to the 1990s, though many of those old bound volumes still remain to be updated for the digital era. If you are familiar with this magazine and what we have been doing over the last dozen years, you know that sharing the history of the Treasure Coast is one of our biggest objectives. Many of our issues feature a history story, and for the past three years we have helped produce the Treasure Coast History Festival. Memories are not always reliable, and many firsthand witnesses have passed on, so we often turn to old newspaper accounts or photographs kept by sources to bring our stories alive. Through our various researching over the years, we’ve come to appreciate the need to digitize the newspaper and photographic resources of the Treasure Coast. Blessed with more abundant resources, the Indian River County Library has been at the forefront of digitizing the community’s historical collections at its Archive Center & Genealogy Department. At this year’s Treasure Coast History Festival, scheduled for Saturday, Jan. 12, at 11:30 a.m., we’ll have a session on “Saving Our History, One Page at A Time’’ in which we’ll feature various representatives of the community — historians, librarians, publishers — together. One of the speakers will be Pam Cooper, who has been working with our magazine recently and who led the effort to create the Archive Center and Genealogy Department in Indian River County. We also hope to compile a list of volunteers from the community who can help digitize and catalog historical documents. The task before us is large. The St. Lucie County History Center has an entire library of documents — memoirs, photographs, tape recordings — that need to be digitized. We hope you’ll attend this as well as the other free sessions scheduled at the History Festival in downtown Fort Pierce on the 12th. At 10 a.m., we’ll have a session on the History of Piracy on the Treasure Coast, and at 2 p.m., Seminole historian Andrew Frank of Florida State University will deliver a session on Seminole culture. That program is funded by the Florida Humanities Council. The free festival will also include historical re-enactments, ghost tours and historical trolley rides, along with a genuine Summerlin Family fish fry for $12 a plate. This year’s festival will kick off in Vero Beach on Saturday and Sunday, Jan. 5-6, from 10 a.m. to 4 p.m. with Waldo Sexton Homestead Days at the original homestead (5000 12th St., Vero Beach) of Waldo Sexton.